Please consider helping us with a modest gift of $25 or more, which helps Missouri's Civil War Heritage Foundation pay for staff, supplies, and office utilities. These things are fundamental to our continued success. Silver Level donors receive, free of charge, a military challenge coin depicting one of Missouri's Civil War Heritage sites. This solid bronze keepsake reminds you of your commitment to the caues of preservation and public education, and helps you reach out to others who share your values. 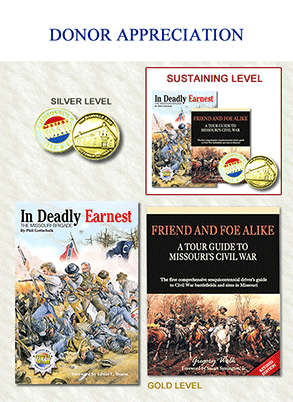 At the Gold Level, you may elect to exercise a 50% discount on one of the books that Missouri's Civil War Heritage Foundation distributes. For more information, and for instruction to make your gift by check or credit/debit card, Click Here. You will find there more information regarding benefits of giving at our Sustaining Level. Corporate and family trusts and foundations with a focus on historic preservation and rural economic development can meet their goals and objectives by contributing to Missouri’s Civil War Heritage Foundation. Corporate entities have opportunities to use modest portions of their ad budgets to make a lasting impression in their communities and constituents, by sponsoring educational panels and academic events. MCWHF Educational Panels are the basic building blocks for our programs to build Missouri’s inventory of cultural tourism sites and to educate Missouri visitors. Whether they highlight historic structures or battlefields, these high-quality 3 foot by 2 foot UV resistant fiberglass panels, set in aluminum frames, are intended to last for years. Tasteful acknowledgment for sponsors appears on all of our Panels. MCWHF is using battlefield archeology to find, mark and interpret Missouri Civil War battlefields. Missouri – the northernmost and westernmost state with substantial Civil War battle resources – stands to benefit more than any state in the Midwest by developing these apex attractions. For information on the economic benefits of battlefield preservation, see the government publications available for download at http://www.achp.gov/economic-community.html. Battlefield preservation represents a near-ideal common ground for those who strive for rational economic development and for those who promote the conservation of our landscapes, farms and wildlife habitats. All of our efforts focus ultimately on preserving the memory of these places and events for future generations. For more information about our programs, contact us by email or phone (877) 221-3133.